Apple’s App Store lately bears a curious resemblance to the American book trade of the late 18th and early 19th centuries. At the time, Congress hadn’t gotten around yet to settling copyright law. Often, printers would poach each other’s works. 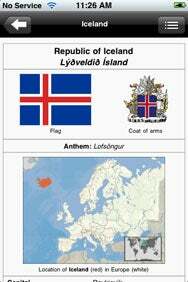 Royalties existed in theory rather than practice. Writers, as always, were routinely cheated of their earnings. Noah Webster, the dictionary man, fought for years against publishers who made a fortune on his Blue Back Spellers while he struggled to eke out a living. How does the near anarchy of early American publishing compare to the App Store today? Nobody is poaching copyrighted material, of course. But developers are competing to sell public domain works, or materials they’ve licensed legally from publishers. It isn’t always easy to tell what’s what, or what’s good. Two developers, for example, are peddling two versions of the Concise Oxford English Dictionary. And there are at least three competing versions of the CIA Factbook for sale. I reviewed Western ITS’s World Factbook 2008 ( ) a few weeks ago. Although the facts within the Factbook are solid, the app itself was a disappointment. Several comments on the piece and elsewhere pointed to World Wiki Plus as an appealing alternative. So I decided to take a look. The World At Your Fingertips: The entry for each country in World Wiki Plus gives you an overview of the relevant facts. Tapping the menu button in the upper right corner breaks down data by category. Tech Lumina’s World Wiki Plus is an inexpensive improvement over World Factbook 2008 (and a slightly beefed up version of Tech Lumina’s free World Wiki). World Wiki Plus also uses the data from the latest official CIA World Factbook. And although World Wiki Plus has a few shortcomings—very few, really—it has all of the features and the flexibility that its more expensive competitor lacks. World Wiki Plus has a straightforward, no-frills interface. When you launch the app, you see the A-Z list of 200 countries and territories with their respective flags. Tap an entry and up pops a new window with the country’s name in its native language, flag, coat of arms, motto, map, and vital statistics. Each entry is presented as a straight list of facts. If you tap the menu button on the upper right hand of the screen, however, you can have the information broken down by category, such as geography, people, government, economy, an so on. You can view World Wiki’s entries in landscape mode, and the app’s san serif typeface is easier to read than World Factbook’s more academic serif font. And you can zoom in and out of World Wiki’s entries with a just tap. This makes reading easier, since the default type size is quite small. But the World Wiki Plus’s maps aren’t worth zooming in to scrutinize. I thought World Factbook 2008’s maps were too static too be useful and too small to view easily. But at least you could see where a country’s capital and other major cities are located. World Wiki Plus has a similar problem. It, too, uses the CIA World Factbook’s small, static maps. The zoomable maps only show you where the country is on a globe. I guess that’s fine as far as it goes, and I wouldn’t expect World Atlas quality, but more detail is certainly preferable to less. Another National Anthem: World Wiki Plus lets you listen to many of the world’s national anthems, though you’ll need a Wi-Fi or 3G connection to take advantage of this feature. One of the most noteworthy features of World Wiki Plus is the inclusion of many of the world’s national anthems. But unlike the rest of the app, listening to the national anthems requires a live connection, preferably Wi-Fi or 3G. 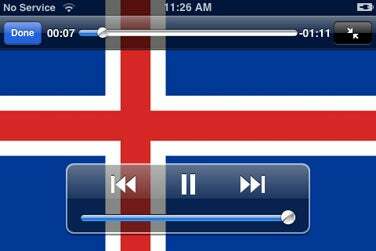 Hearing the stirring chords of Lofsöngur, Iceland’s national anthem, make it all worthwhile. If I had the power, I would let users of World Wiki Plus choose either the “wiki” page or the CIA World Factbook listings as the default setting. And I would make every single map viewable up close. Finally, if developers are going to take the time and trouble to compile all of this useful government data in a convenient application, they should go all the way and include the appendices from the Factbook, too. World Wiki Plus is a marked improvement over its more expensive competitor, a useful and user-friendly reference tool. I look forward to the 2009 update. The application is compatible with any iPhone or iPod touch running the iPhone 2.x software update.